We've wrapped up development on Office 365 support. If you use Office 365 and/or Azure AD, contact us at help@foxpass.com to get involved with our Beta program. Stop struggling with OpenVPN! For our AWS users, we now offer an AMI that creates a simple IPSEC/L2TP VPN server. Authentication is checked against Foxpass and optionally against Duo (for two-factor authentication). You can build it yourself from our Github repo or find the AMI on Amazon marketplace in the coming weeks. Contact us at help@foxpass.com for early access to the AMI. Foxpass's RADIUS servers now have support for customers who have dynamic IP addresses. Just enter the hostname when adding a new client on the RADIUS Clients page and Foxpass will track and update its systems whenever the IP address changes. Admins can now specify custom user fields from the Config page. Each user can now have custom data attached to their account. You can specify up to 10 fields and corresponding display names for your organization. 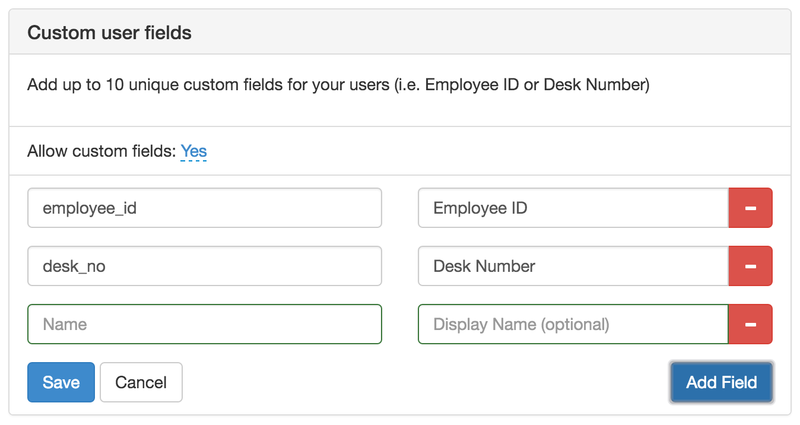 You can add things like Employee ID or Desk Number for better team organization. These fields are exposed in both LDAP and the API. We've fully rolled out LDAP logging, allowing you to see all attempted connections to Foxpass (or your delegated auth service) over LDAP on the LDAP Logs page and via the API. Logs will be visible for free for the previous 24 hours. If you'd like to view all RADIUS and LDAP logs, contact us for pricing. We've also updated the RADIUS Logs page to use the same interface as LDAP Logs on the site and via the API. The User page now supports username filtering, making it easier to find users in large organizations. Check the top right corner of the Users page to try it out. You can now see when the last time a user successfully logged in using LDAP or Radius on the Users page. Engineering and Admin users can set their default timezone from the My Settings page. All timestamps on the website will be shown in this timezone, and LDAP and RADIUS log filters will default to using it. We've added a new API endpoint to check if access should be granted for a user to a specific resource. Full specifications can be found here. We now have an install script to set up Foxpass LDAP integration on Ubuntu 16.04. You can find setup instructions here. Foxpass is now available in the Google Apps Marketplace.